Through the years as a family, we would think of 4-H and FFA projects that could be built to share at the local county fair and the Iowa State Fair. Brainstorming while riding in our pickup from farm to farm was a natural occurrence. Each year a new idea was conceived, designed, and built. Each year new skills were gained. Soon the favorite projects were a combination of machines, electronics, and software. A combination called mechatronics. Mixmate is our first product. This product has been an idea wanted on our farm for many years. 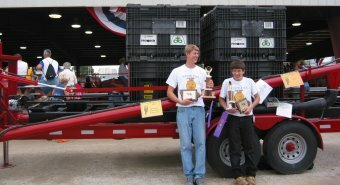 It has its roots in a seed tender that was built by Brent and Luke as an FFA project and exhibited at the Iowa State Fair. We continue to support the FFA program at the Iowa State Fair through an Innovation Award and Scholarship. We also support the local 4-H and STEM programs. These programs have been very beneficial for our family and we greatly appreciate them. You could say we put our ideas - theories - into practice. And these were not just ideas, they were powerful ideas that led to practical solutions we wanted on our farm. Engineering degrees and engineering jobs followed, but the farm and entrepreneurship were still a calling. It seemed natural to take what we have done for many years to a new level and our new manufacturing company, Praxidyn, was born. The products that we build will automate processes around the farm. We believe that data should be collected automatically as you work and be available at your fingertips on your smartphone or in the office. Intersect is our cloud service connected to Mixmate. Intersect is the easy way to access and manage multiple Mixmate systems. Intersect connects the equipment and smartphones to the office data systems. Your data is backed up automatically and securely. Mixmate and Intersect are the foundations that we will build upon. The electronics are designed to be modular. This is a major feature that gives our systems flexibility. Anywhere a scale or flowmeter is involved, data is generated and we want to collect the data for you automatically. The flexibility of the hardware is paired with flexibility in the software. Systems can be as simple as data logging from a scale or flowmeter. Farmers and commercial applicators can use the system in the field to support ground application equipment. Aerial applicators need portability for helicopters in the field and airplanes may need a stationary system at the airport. The software supports small operations all the way to enterprise level organizations. The cloud connection through Intersect supports third-party software systems. Mixmate brings value in many ways. We all must do more with less manpower. Fast fill times keep expensive machines rolling with less stress on the operators. Automatic data collection reduces recordkeeping time in the field and the office while improving accuracy. Seed treatment options will be coming. We saved seven dollars per acre on our farm by applying seed treatments ourselves. Return on investment can be less than a year through efficiency, accuracy, and cost reductions. Farming is a very relationship-oriented business. Praxidyn is no different for us. We look forward to meeting our customers and serving them well. Our business cards have a quote on the back from Proverbs 3:6. “In everything you do, put God first, and He will direct you and crown your efforts with success.” These words and many more words from the Bible direct us every day. This is the foundation that we build our business upon. Plan ahead. Learn more. Contact us now! Powerful ideas with practical solutions. We reduce the time, complexity, and costs of ag chemical mixing. As we move forward into the future with our first product, Mixmate, and our cloud service, Intersect, we also move forward with our new manufacturing company - Praxidyn. We are constantly striving for improvement of our own farming operations and how to make our mixing system even better. Trade shows have given us the opportunity to learn the needs and difficulties that many operations face. Our system has evolved to meet these needs and opened the door to new markets and applications.